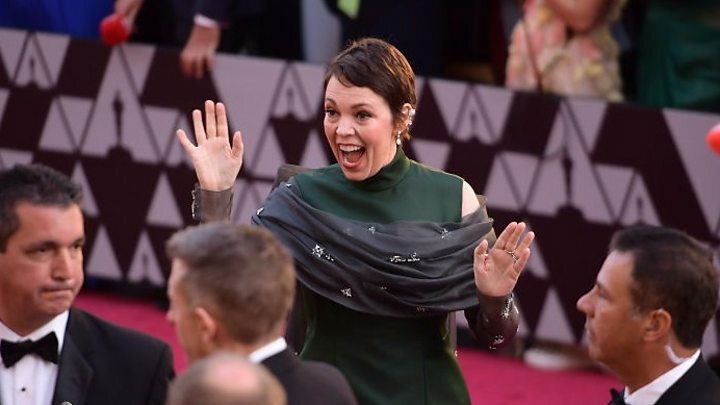 British actress Olivia Colman defied the odds to scoop an Oscar on a night when Green Book also sprang a surprise by winning the award for best film. 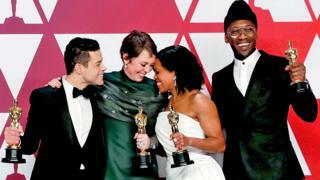 Green Book won three trophies in total, including best picture, which had been expected to go to Netflix's Roma. Holding back tears on stage, Colman said: "It's genuinely quite stressful. This is hilarious. I've got an Oscar!" "I think about what it would have been like to tell little bubba Rami that one day this might happen to him, and I think his curly-haired little mind would have been blown," he said in his acceptance speech. "That kid was struggling with his identity, trying to figure himself out, and to anyone struggling and trying to discover their voice - listen, we made a film about a gay man, an immigrant, who lived his life unapologetically himself. "And the fact I'm celebrating him and this story with you tonight is proof that we're longing for stories like this." It was later reported that Malek fell off the stage after the ceremony concluded and had to be helped into a seat by security staff. The 37-year-old was reportedly attended to by paramedics, though he made no reference to the incident later when he spoke to reporters backstage. "Trying to capture his essence pushed me to my ends, which was a reflection of the person he was and the life that he lived," Ali said. The film tells the story of Shirley's tour to the racially segregated US Deep South in the 1960s, but its chances had been thought to have been dented by a series of controversies. She said: "I'm an example of what it looks like when support and love are poured into someone - mom, I love you so much." It's been three decades since his landmark films She's Gotta Have It and Do The Right Thing - and now Spike Lee finally has a competitive Oscar. He already has an honorary Oscar, which he received in 2016. He didn't win this time for best director - he won best adapted screenplay for BlacKkKlansman, which tells the true story of a black police officer who infiltrated the Ku Klux Klan. He then made the most political remarks of the night, saying: "The 2020 presidential election is around the corner. Let's all mobilise. Let's all be on the right side of history. Make the moral choice between love versus hate." He added: "Let's do the right thing. You know I had to get that in there." US President Donald Trump later reacted to Lee's comments, saying it was a "racist" attack on his presidency. Asked backstage about Green Book's best picture win, Lee - drinking from a champagne flute - said it made him feel like he was courtside at Madison Square Garden and "the ref made a bad call". But Mark Ronson shared the best song award with Lady Gaga, among others, and there was a string of British winners in some key technical categories. "We are not your hosts this year but if we had hosted, it probably would have gone like this," Fey said - before the trio launched into a sketch poking fun at some of the nominees, which is one of the host's usual jobs.